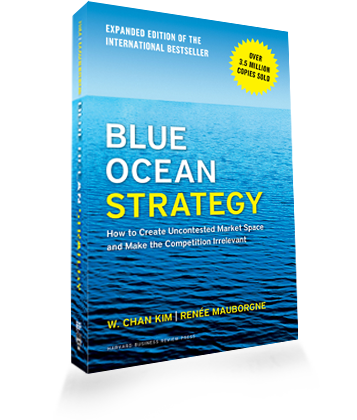 Creative, digital and cultural enterprises can radically improve their businesses using ‘Blue Ocean Strategy’. Advising a creative business in Spain, I suggested that they adopt a Blue Ocean Strategy. The company was working in a highly competitive marketplace, with many other businesses offering similar services. This meant that very often they were competing on price. Of course this drives prices down for all suppliers and consequently reduces profitability generally. We analysed how they could differentiate themselves from the competition. What could they do that rivals could not? In what ways were they different from the competition? What skills, credentials or connections could they use to outmanoeuvre competitors? These questions are at the heart of understanding competitive advantage. The answers to these questions helped to find particular niches, to focus on the right customers, and decide which kind of projects and clients NOT to deal with in terms of competition, prices and profitability. This approach leads to devising a Unique Business Formula for an enterprise. At the same time, we identified a more radical approach to business development and growth. Instead of simply becoming better at navigating the shark-infested bloody ‘red ocean’, they could find ‘blue ocean’ where rivals don’t operate at all. This ‘blue ocean’ means doing things differently, in ways that competitors do not – and ideally – in ways that rivals cannot. Importantly, this does not mean completely starting afresh, with a totally new business. 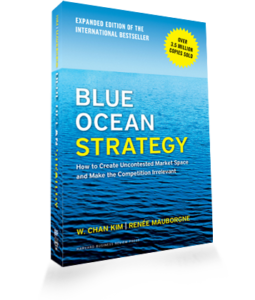 Often, Blue Ocean Strategy is successful because a company’s skills, products and other offerings are ‘re-packaged’ in ways that appeal to new customers or more profitable markets. For example Cirque du Soleil didn’t abandon circus, they simply ‘repackaged’ it. They adapted to the reducing appeal of traditional ‘circus with animals’ due to changes in the social environment (see PEST/ICEDRIPS analysis). They repackaged circus to be more akin to theatre and in doing so reinvented the definition of circus, found new audiences, and left competitors behind, bleeding unprofitably in the red ocean. The original article in the Harvard Business Review by W. Chan Kim and Renée Mauborgne features Cirque du Soleil. The article was later developed into a book ‘Blue Ocean Strategy: How to Create Uncontested Market Space and Make the Competition Irrelevant’. Explained elsewhere, for example in this article ‘Blue Ocean Strategy: Creating Your Own Market’, the emphasis is on finding new markets where rivals don’t operate. This echoes the advice to creative businesses by Richard Veal of New Mind who is quoted saying: “Identify a market segment and make it your own” in my book ‘T-Shirts and Suits: A Guide to the Business of Creativity’. Blue Ocean Strategy requires creativity in business thinking.This means that creatives in business have an opportunity to apply their creativity not only in the studio – but also in the board room. Read about other Business Concepts, Techniques and Terms to help your business become even more successful.